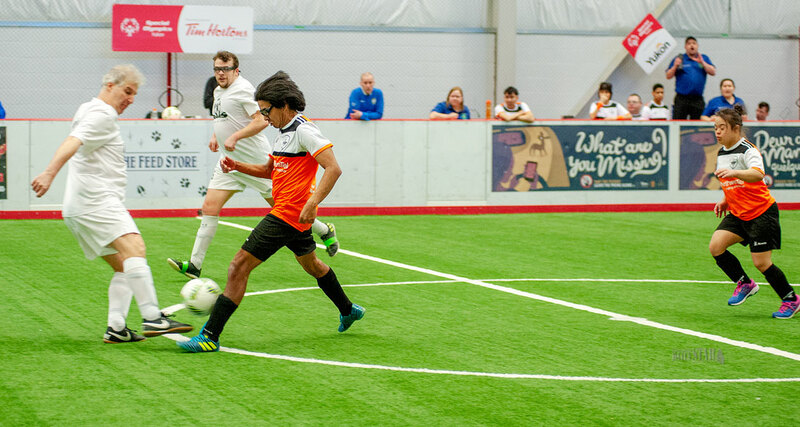 CHALLENGE – Kenny Atlin (black shorts) of the Northwestel Charging Moose challenges a Regina Raider during this weekend’s indoor soccer tournament as teammate Jamin Stange of Dawson City backs him up. Whitehorse lost the game to the Raiders who went on to win gold after remaining undefeated. 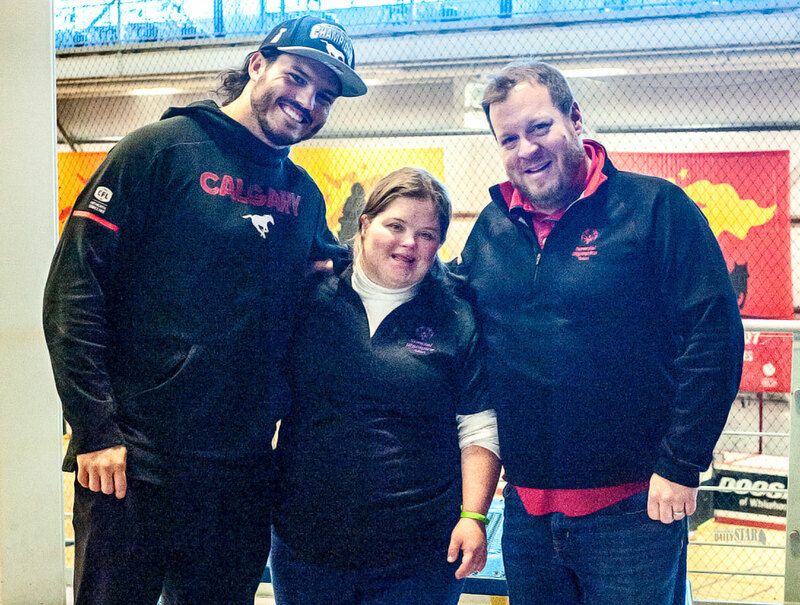 GREY CUP SMILE – Grey Cup champion Alex Singleton, left, poses with his sister Ashley and Serge Michaud of Special Olympics Yukon. Singleton served as honourary coach for this weekend’s indoor soccer tournament. The Regina Raiders left little doubt who was the top team on this weekend’s invitational indoor soccer tournament hosted by Special Olympics Yukon. The Raiders dominated in each of their three round robin games to earn a spot in the gold metal game against the Coquitlam Vipers from B.C. who went 2-1 in the round robin, their only loss coming against the Raiders. Regina did not relinquish their dominance in the gold metal match as they handily downed the Vipers to remain undefeated and champions of the second annual Whitehorse Tim Hortons National Indoor Soccer Invitational. For the local Northwestel Charging Moose, it was a case of close but just not close enough as they lost 6-4 in the bronze medal game to the P.E.I. Strikers. It was the same team that denied them gold at last summer’s Special Olympics Canada Summer Games in Antigonish N.S. And despite two early leads in the battle for bronze the Charging Moose couldn’t hold off the Strikers. Among the highlights of the tournament was the presence of honourary coach Alex Singleton who won the Grey Cup in November as a defensive back with the Calgary Stampeders. Singleton signed with the Philadelphia Eagles of the NFL last month. Executive director Serge Michaud said the second annual tournament was everything they could have hoped it would be. “There were a number of close matches,” he said in an interview this morning. Michaud said it was particularly moving to see 200 or more fans in the stands Friday evening for Whitehorse’s opening game against the P.E.I. Strikers. The Moose lost a squeaker, 3-2. “What really stood out for me was how much local engagement there was,” Michaud said. “Over 200 turned out for that game. Michaud said Tim Hortons and both the governments of Canada and the Yukon have to be recognized for the financial support they provided. Nine teams from across Canada expressed an interest in coming to the four-team tournament, he said. Michaud said P.E.I. was getting a spot because the Yukon wanted a shot at a rematch against their rivals at the Summer Games. There has to be a B.C. team just because Special Olympics B.C. is such a good neighbour to Special Olympics Yukon and Regina got in more or less on a first comes basis, he said. He said only one person from the three visiting teams had been ever been to the Yukon, and they really liked it, even the -35 temperatures, he said. It was the RCMP and their affiliation with the Special Olympics program that brought up the Grey Cup champ to serve as honourary coach. So as not to favour one team or another, the 25-year-old Singleton would spend half the game behind one bench and second half behind the other. In his address to the athletes and coaches at Friday night’s opening ceremony, he told the athletes that it is the inspiration he gets from them that drives him. “If I inspire them they inspire me 10 times more,” said Singleton while donning his Stampeders Grey Cup hoodie and ball cap. “They are the reason I play the way I do. Singleton was here with his 28-year-old sister Ashley from California who’s been with the Special Olympic program for 25 years. And they did the things you do when you want to get a flavour of the northern lifestyle. They went snowmobiling, watched the northern lights and did some dogsledding. And of course they watched the Super Bowl at a gathering hosted by the RCMP. On Saturday, Singleton was calling for victory by the New England Patriots, and he was right. But it was the last time he’ll be pulling for the Patriots, he suggested. From here on, he’s all Eagles. “There’s nothing like watching a Super Bowl game with somebody that really gets it,” Michaud said.